The QuietPro BP HEPA with QuietPower® Technology delivers high performance and exceptional cleaning strengths for environments where low sound levels are critical. 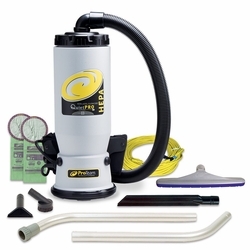 Never worry about disrupting building occupants during regular business hours again..
Includes: Tool Kit D (107100), Xover Floor Tool w/ 1 1/2" Telescoping Wand, 5" Upholstery Tool, 3" Dust Brush, 17" Crevice Tool, 1 1/2" static dissipating vacuum hose, a 50' extension cord and two replacement Intercept Micro® Filters. Static Lift: Power Mode: 82 in., Quiet Mode: 45 in.